Receive a complimentary pillow with every purchase of a mattress, made from the same materials the memory foam pillow with compliement yoru mattress perfectly. Where do I use my Dormeo voucher code? Find your code of choice on our website and click through to the Dormeo website. Select the items you want and add them to your basket. When you’re finished go to ‘Basket’, add your code into the box provided and click ‘Apply’. Your discount will automatically be subtracted from the total. Dormeo has been selling luxury beds, mattresses and bedroom accessories across Europe for the past 10 years. Their high-quality memory foam mattresses are available in multiple styles with ranges such as memory fresh, memory aloe vera and memory silver. They also stock other kinds of mattresses like hybrid and pocket sprung, which are available in sizes single to super king. They also have an impressive Octaspring range and sell all kinds of beds including divan and ottoman beds as well as headboards. Accessorize your bed and mattress with the stylish and high-quality bedding available at Dormeo. Stock up on pillows, mattress toppers, duvets and protectors and enjoy the best night sleep at an affordable price. If you want to buy on a budget Dormeo have an impressive sale section and warehouse clearance available with tons of discounts and offers as well as a handy sleep blog that can help you find what you’re looking for. 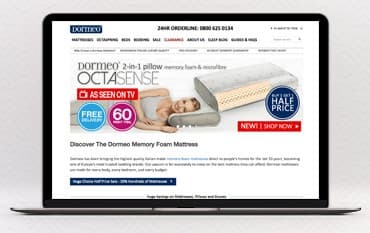 If you’re really stuck for what to buy there’s always the guides section too which explains everything you need to know about memory foam, offers solutions for back pain and tells you when it’s best to replace an old mattress. As well as all this Dormeo also offers free delivery, interest-free credit and a 60-night comfort guarantee, allowing you to return your mattress after 2 months if you’re unsatisfied with its comfort and performance. Dormeo often wins awards for its innovative and groundbreaking product technology. The Octaspring technology devised by Dormeo has been recognised by the aviation industry and was awarded the prestigious Crystal Cabin Award by the company. The Octaspring aircraft seat has been praised for its improved comfort and better breathability, as well as it’s 30% reduction in cushion weight; a key breakthrough that’s now helping operators to save fuel and reduce CO2 emissions. Dormeo has devised an impressive range of Octaspring technology, reinventing memory foam mattresses to change the way you sleep forever. Octaspring’s patented memory foam springs of different firmnesses are arranged in up to 8 body zones, allowing you to enjoy pure memory foam comfort with 8 times better breathability than traditional memory foam. Built up in layers, individual Octasprings dynamically conform to the contours and movements of your body in all sleeping positions, while also providing unrivalled ventilation that keeps you cool and fresh all night long. Dormeo not only offer mattresses that use this impressive Octaspring technology but also pillows, divan sets and mattress toppers too. All of which are made with the same technology and luxury materials to provide an excellent night sleep for everyone. Get a better night's sleep for less by shopping in the Dormeo sale or clearance section for mattresses, beds, divan bases, headboards and much more. There's a limited stock available, so take advantage of these low prices by placing an order online today. Shop from the warehouse clearance section for end of line products and highly reduced items that aren’t going to be around for much longer. Or check out the sale section where you can save up to 60% off. Find great deals on mattresses, toppers and bedding and kit out your bedroom for less. Delivery of all Dormeo mattresses is free, a charge of £4.95 is applied to smaller items on orders under £80. The majority of items are delivered within 14 days, however in some cases of high demand please allow 28 days for delivery of your order. All Dormeo mattresses have a 60 night trial period. Sleep on your new mattress for 60 nights and if you’re not happy you can return it for a full refund. Dormeo has been bringing the highest quality Italian-made memory foam mattresses direct to people's homes for the last 10 years. Now one of Europe's most trusted bedding brands, Dormeo not only provides mattresses but beds and bedding too. Dormeo mattresses are made for everybody, every bedroom, and every budget, they even offer Dormeo discount codes through us so you can save money on your purchases too.